firefly « AFTER THE POP ! Neath the canopy of trees. Flying in their magic realm. The fireflies in the air. Till early light, without a care.
. when i was a young boy growing up in rural illinois, the summers evenings were often peppered with the flashes of fireflies. i chased them, i caught them, i saved them, i let them go, i made jewelry with them- rings, bracelets, necklaces- and connected to a higher power with them. their tiny lights assuring me that there is power beyond my understanding. 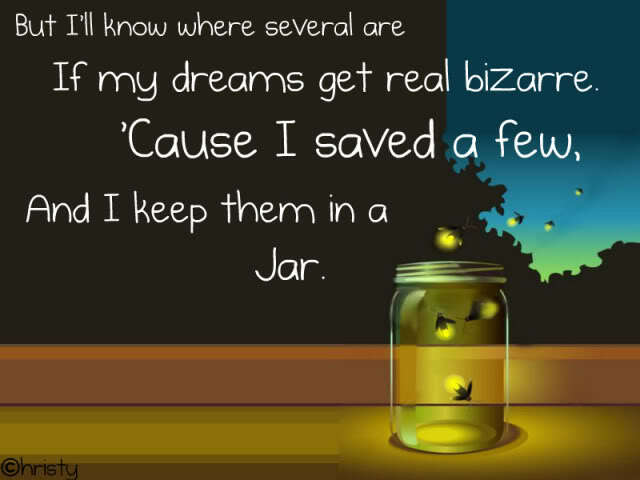 i don’t necessarily play with fireflies in my life now. but i still believe in their magic. and my boyhood friendship with these fairy-like creatures paved the way for me to have a spiritual program today. and that spiritual life continues to bring light into the darkness of my being today. i heard this song today on spotify and decided it was post-worthy. ed sheeran seems to me to be a fresh voice and a thoughtful creative spirit. i trust you will see why i am a fan. This entry was posted in 2nd stage recovery, ed sheeran, firefly, magic, music.